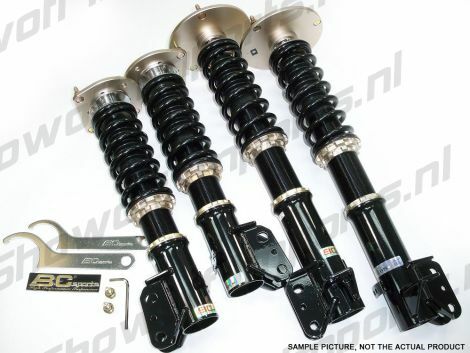 I found the Honda Civic FK8 Type-R 17+ BC-Racing Coilover Kit [BR-RA] on ShowoffImports.nl and thought you might like it. BC Racing is the own brand range of coilover kits from a large manufacturer of suspension products. The mainstay of the manufacturer is producing units for a wide range of companies including a number of premium brands within the coilover market, brands we cannot mention here for legal reasons but it many of the most wellknown Japanese and American brands. The release of the BC Racing own brand gives end users the benefit of the knowledge, manufacturing processes and economies of scale of a large suspension manufacturer but at the prices which are more associated with the lower quality units cluttering the market at the moment. Damping adjustment allows you to fine tune your car to suit your needs and the cars intended use. Adjustment should always be made in axle pairs, so both fronts must be tuned the same and both rears must be tuned the same. Decreasing front damping will speed up the weight transfer as you apply the cars brakes thus increasing front traction. You want some degree of weight transfer to occur to load up the front tires to maximize braking ability and to help the front end hook up for corner entry. The front loading helps prevent under steer. Such subtle tweaking of the damping rates can make a big difference to the way the car handles. 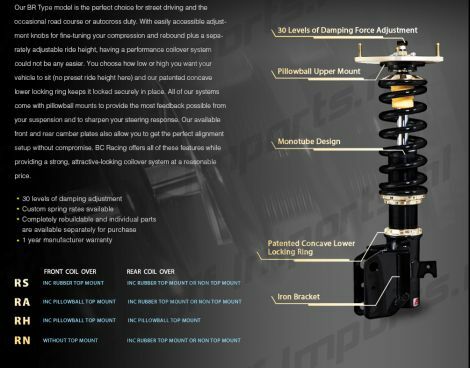 Coilover and after market damper manufacturers run quality control system that can lead to a large variation in damper to damper performance. This means that you can have different damping rates at each corner of your car even when the dampers are dialled in to the same setting via their adjuster. Because damping settings are so crucial to a vehicles handling, this can lead to a handling imbalance where the car will pull slightly under braking and its turn in and mid corner handling characteristics can differ from left to right hand corners. It’s because the damping rates are so crucial that BC Racing check each and every damper they produce on an in house damper dyno. The compression and rebound damping rates are recorded and the coilover kits are only put together using matched dampers. Through this in house individual checking BC Racing can be confident that the kits are produced with matching dampers. BC Racing run to a tolerance level 3 times more accurate than general original equipment manufacturers so the difference in damping rate between BC Racing units is a third of that aimed for by most original equipment manufacturers. 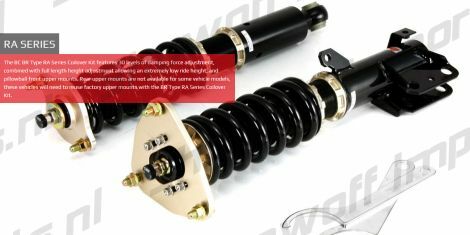 The BC Racing coilovers are a direct replacement for the original equipment. Unlike other brands of coilovers, the BC Racing range do not require brackets fabricating, cable ties or jubilee clips to install. The bottom mounts come with all brackets to take the original ABS sensor leads, brake lines, anti roll bar drop links etc. Just take off your original equipment suspension and install the BC Racing suspension. A straightforward and simple install. Showoff Imports is chosen as the official NL distributor of BC Racing products. 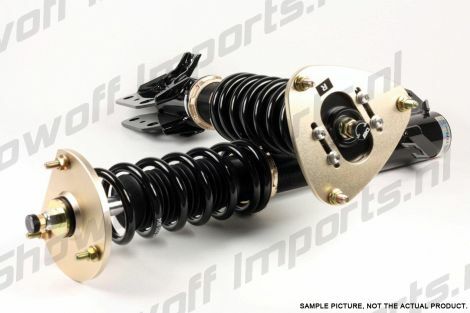 Showoff Imports has over 10 years experience in modifying cars and selling/installing coilover kits. We distribute BC racing products among our clients that can be found anywhere in Europe. We also have over 200 dealers in 18 different countries so it should be easy to get a BC racing set yourself! BC Racing is also a brand that is being used in Racing and Drifting a lot. In the Benelux you will more and more cars using the BC racing products in the professional race series like Time Attack or Drift Championships. In USA and UK the brand has already proven itself being able to perform under race use and BC racing is proud sponsor of many race series and cars.